The Greens Farms Academy varsity volleyball team poses for a photo with the New England Class C runner-up trophy after falling to King in the final last week. WESTPORT — The Greens Farms Academy athletic program was just one of two NEPSAC schools that qualified four different varsity teams for New England Regional tournament action earlier this month. Four different Dragon teams—volleyball, field hockey and boys and girls soccer — all advanced to NEPSAC Class C tournament action. Only Noble and Greenough School of Dedham, Mass., pulled off the 4-for-4 effort and, with football, it actually qualified five teams for postseason competition. Here’s a rundown of GFA’s New England tournament run. 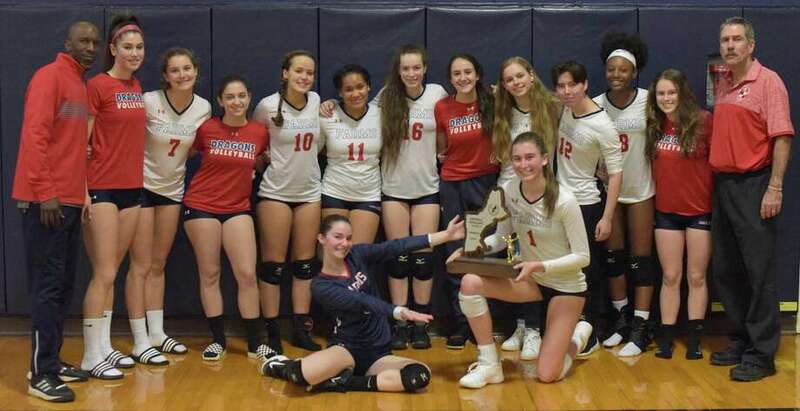 After winning an emotionally and physically draining five-set match in the semifinals, the Dragons went to King to take on the top-seeded Vikings less than 24 hours later and fell in a 3-0 NEPSAC Class C championship match. The Vikings defeated GFA 25-16, 25-20, 25-23. Kirwan Carey (Westport) had 15 kills, five digs and four blocks in her final game in a GFA uniform while Meg Nesi (Fairfield) had 20 assists. Kristiana Modzelewski (Westport) added six kills while Alex Nason (Darien) led the defensive charge with 10 digs. Jessica Cramer (Wilton) added seven digs while Leah Attai (Bridgeport) had three. GFA finished the season 16-6. The Dragons clinched the berth in their first New England championship game since 2012 with a thrilling 3-2 win over second-seeded Winchendon School in Massachusetts. GFA pulled out the match by scores of 25-22, 25-20, 16-25, 17-25, 17-15. Carey sent down 32 kills to lead the GFA charge while Nesi set what is believed to be a school record with 46 assists. Modzelewski added 11 kills while Ava Ewing (Darien) added five more. Nason's 12 digs led the defense. GFA made sure the Dragons' fall sports season didn't come to an end on Monday, winning their New England Class C quarterfinal by a 3-0 score. GFA won the match 25-11, 25-20, 25-13. Modzelewski had a career-high 11 kills and three blocks to lead the charge. Carey added 13 kills with three blocks and three digs. Nesi had 23 assists while Nason had 10 digs and Attai added seven more. In a game that was closer than the final score indicated, the Dragons fell to Millbrook in the New England quarterfinals by a 6-2 count on Monday. Aidan Murphy (Darien) scored both of GFA's goals with assists going to Charlie Benson (Darien) and Zach Liston (Wilton). Max Yates (Fairfield) made nine saves for the Dragons, who finished the 2018 season with an 8-6-3 record. The Dragons lost to a very good MacDuffie team 2-0 in a New England Class C quarterfinal. GFA played well, according to its coaching staff, but just couldn't put the goal in the net. Goalie Lane Murphy (Darien) made eight saves in the game. GFA wrapped up the season with a 14-4-4 record. In a back-and-forth game between two evenly matched teams, visiting Winsor used a late second-half surge to pull away for the win over the GFA Dragons. Trailing 1-0 at the half, GFA's two Lucy's--Lucy Nelson (Westport) from Lucy Holzinger (Westport)--got the Dragons on board to tie the game. Winsor scored two goals late in the game to clinch the win, however. GFA had nine penalty corners in the game, including five in the last 10 minutes of the first half, but couldn't convert. Goalie Nikki Farber (Westport) made six saves. GFA finished the season 12-5-1.